I had two unfortunate events in my trip back to Manila from Hongkong. Cathay Pacific was late for an hour and second the whole NAIA terminal 3 airport is brown out! This is the first time I have ever heard of a place that serves airplanes and passengers on air from all over the world without electricity. We were about to land midnight when we're told to remain a little more because the Terminal 3 of NAIA has no electricity. We spent about 45 minutes then finally got out of the airplane. It was too hard for us to walk inside the airport. The hardest thing is that we needed to fill out the arrival card. There was a store that's still open with a lamp on. Everyone had to go near the lamp around the store so that they have a light while they wrote the detaills. See the pic above! I can feel the heat even though it's early in the morning. I'm thankful I didn't have checked in baggage. There were loud screaming I heard from tired, angry and sleepy passengers trying to get their baggage or maybe switched belongings in a dim light. I went to the toilet to pee and able to speak with one of the staffs. She said there's an electric connection that exploded causing the entire power of NAIA terminal 3 to shut down and not able to pickup signal properly from arriving or departing airplanes. 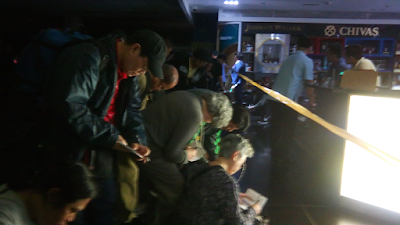 There were generators that light up a few spots inside the terminal but it isn't enough. Even the stations of Philippine immigration officers are only using the lights of their mobile phones for them to check our passports. It did took us a while while lining up. This made me realize NAIA isn't prepared for any contingencies like this. They should be provided with proper lamps to scrutinize documents. This is just brown out, how about if it's earthquake? I was told the power shortage happened around 9pm. It is already 2am now here in NAIA terminal 3, still it's brown out. The shuttle is no longer serving and I am reluctant to walk all the way to a station where I can get a jeep and catch a bus to get home. I decided to sleep near the glass wall at the Arrival area upstairs. I woke up around 7am, met a few passengers who are very dissappointed that their flights have been cancelled.